Despite everything you have heard in the news the last month or so, a quite a few credible sources are saying Chip Kelly is staying firmly planted in Eugene. The Duck faithful had all but moved on to Mark Helfrich being the new head coach last Friday when sources leaked that Cleveland was finalizing the contract to make Chip Kelly their new head coach. The next day, sources reported that Cleveland had moved on to searching for a new coaching candidate and that Chip was talking to Philadelphia about their opening. 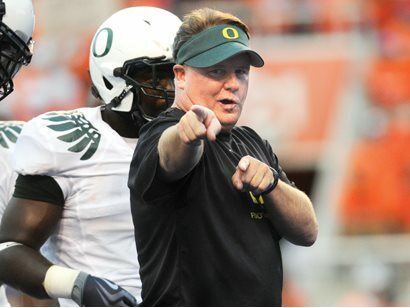 Today, ESPN broke the news that Chip Kelly was, in fact, staying at his current coaching job for the Ducks. And there was much rejoicing in Eugene, Oregon. Not so much rejoicing in Palo Alto, Los Angeles, Seattle, Corvallis, etc. For the short-sighted football fan, everything seems cheery in the Land of the Duck. But is this “will he, won’t he?” business getting to a point where it will detriment the team in the long run? High school seniors don’t like it when coaches have a reputation for bolting (see: Lane Kiffin), and when Coach Kelly does this charade every January it cannot look good to these recruits. And, God forbid, if there are any sort of sanctions in the future for the Ducks, it will be essential to get quality over quantity. Now, I am not trying to create any sort of pandemonium or conspiracy theory for the Ducks’ demise. I am only pointing out the possible ramifications for Chip’s “promiscuity,” if you will. I am as delighted as the next fan that he will be coming back to the helm of Oregon football. The five years he has been involved with Oregon have been nothing short of magical. But unless Oregon’s administration can guarantee the long term security of Chip Kelly, early January will quickly become a consistently uneasy time for every Oregon follower. Let us take a look at what Chip would be leaving in Eugene, though. He is perhaps the highest profile man in the state of Oregon. Amassing a 46-7 record (2-2 in bowl games, all BCS bowls), he is demonstrating unparalleled success for Oregon sports, college or otherwise. He is making $3.5 million this year and is the leader of the fastest growing brand in American sports, perhaps in the world. He lives in a beautiful city and his fans treat him as a reincarnation of the Messiah himself. Take all that and tack on that their biggest booster is such an uber-fan that his passion would make Mark Cuban flinch and you have a dream job. Why on Earth would anyone want to leave such a position? Because when ambitious people succeed, they often get bored and look for a new challenge. Don’t ask me how I know this.